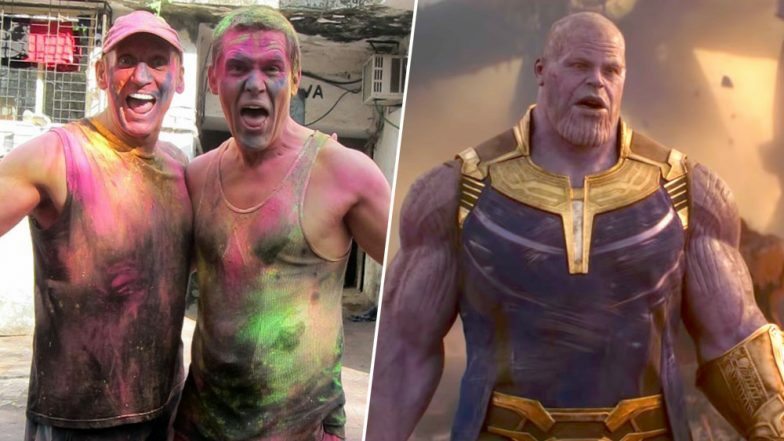 Avengers:Endgame Star Josh Brolin aka Thanos Sends Holi Wishes For Indian Fans With a Throwback Picture! kOAvengers: Endgame is all set to release next month and the build-up towards this Avengers finale has been massive. The film has a huge fan following in India and this is the first time, the film's co-director, Joe Russo will be coming to India interact with Marvel fans in India ahead of the film's release. If all this is any less exciting, Thanos has now sent his Holi wishes to Indian fans. Well, yes actor Josh Brolin who plays the character of Thanos in Avengers: Endgame posted a throwback picture of him celebrating Holi along with a friend, author Gregory David Roberts aka Shantaram back in 2013. Josh Brolin's Thanos nearly wiped out fifty percent of the human race after his snap with the infinity gauntlet in Avengers: Infinity War. As the remaining superheroes unite to fight him back again in Avengers 4, it will be interesting to see how they win over Thanos. Recently, we saw a leaked picture of Brolin's Thanos from the last film and he was seen all armored in that one. Avengers: Endgame: Thanos' New Look From The Film on a Leaked Magazine Cover Shows Him Armoured along With The Infinity Gauntlet - View Pic! Avengers: Endgame starring Robert Downy Jr, Mark Ruffalo, Chris Evans, Brie Larson, Scarlett Johannson, Chris Hemsworth and Paul Rudd is all set to release of April 24.